There's nothing better than winter shots of tents getting pelted with snow, and so here is the Hilleberg Nammatj getting its necessary white powder. MORNING IN THE UPPER BALD RIVER VALLEY: The morning brings a foggy light to the Horse Camp tents as I stir to pee and Mitten is quiet 40 feet away in her roomy wedge tent. Today we have several choices but basically just two: We stay put or we return to the Gorge wilderness. The third choice, to climb up the BMT north/south is not an option which suits me just fine. A dayhike up to the BMT and Old Dog Falls will still be done but nothing more and there's a possibility we will even pack it up today and leave this camp. I'm open to any option except ending the trip. Behind me Upper Bald River sings cheerfully past the old camp which has seen alot of action over the years. A 55 gallon barrel sits nearby, rusted and bottomless, 2 huge cut tree trunks stand on end by the large stone circled firepit, a braced woodpile usually is full of split and stacked firewood and over by the creek in some rhodo are 2 mysterious pits filled with water and a white plastic bucket covered by a rusted tin lid. Next to this are 3 large sheets of wet particle boards, detritus and camp trash brought here by god knows who in god knows what year. OUT FROM CAMP a ways I found a styrofoam cooler with lid but it is burnt history now as is a piece of rope and other litter items. Despite these facts this camp is a clean one and though Mitten thinks it has a bad vibe I feel it to be a pretty little open camp beneath soft evergreens with to me a vibe of many local horsemen coming here to fish and hunt and camp. It never had to grow on me, I've always liked it's level openness, it's close proximity to noisy water and it's nearness to the BMT trail and the ease of the hike to get there. All Hail therefore Horse Camp! A MORNING TURTLEHEAD is moving forth and so I must dig a hole for it and start the birthing process. Wish me luck. Ok, I'm back from turn patrol and I'm sitting in the Nammy drinking hot nettle tea with manna bread after leaving a cup of hot strained nettle tea with Mitten and a small loaf of break. We just returned from a dayhike to Old Dog Falls and the BMT intersection by Brookshire Creek. The misty dreary day finds us in our separate tents reading and writing and waiting out the time till tomorrow when we'll gear up and head back into the Gorge and Big Pine Camp. There's an occasional rain drop hitting the tent but it isn't raining just misting. Little Mitten now sits in my tent with me and naps while I sit up next to her thinking about cooking pasta. We will stay here another night and hit the return trail tomorrow in probably cold temps and maybe snow. In fact, Friday night may bring the white stuff, we shall see. Well, there's a good snow coming down in the night and so we had to leave the hot coals of the firepit and go to our separate tents as the pretty white powder falls. Mitten is in her blue wedge with a candle getting ready to read and I'm in the green tunnel writing out the finishing touches to Day 3. Though I had a rough headache earlier I'm back in woodland form now and I'm very pleased to see snow falling from the sky. MITTEN AND I HAD a great talk around the fire and I only wished I asked more questions of her so as to learn her better, what she wants, what motivates her, where she wants to be, how she feels about things and all the rest. Around a nightfire by tents is the best time to get Little Mitten to think and to talk, it reminds me of the times at the Tipi where I saw a different woman, a happier woman, one without the trials and tribulations of motherhood and full time factory work. And so here now at Horse Camp I have seen the same upbeat person, girl-like and sparkling, camping in this river valley without a care in the world except when she'll have to duke again. Me? I am about ready to stop writing and start reading, the Shackleton story is captivating and except for the Dobson harangue and Chosen People propaganda and brainwashing, the book is well worth every penny. 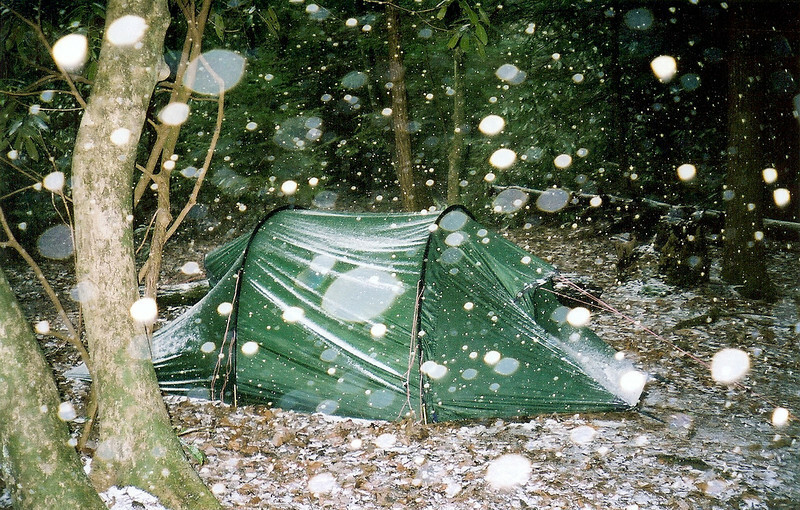 I can barely hear the snow hitting the tent fly and it's a comfort to finally see some snow. Yippee!